Road blocks, pot holes or detours: Pick any comparison you’d like, but Gov. Rod Blagojevich’s plan to pay for new construction projects is on a bumpier road than a school bus with a flat tire. That’s left GOP lawmakers thinking they’ve gained some leverage in finalizing a budget that needs a handful of Republican votes to pass. The Senate Republicans highlighted the ironic convergence of a harsh audit of the Illinois Department of Transportation and the reappointment of that agency’s director, Timothy Martin. This comes in the closing weeks of spring session, when one of the lawmakers’ last major tasks is to agree on how to pay for new construction of roads, bridges and schools. But Republicans and even some Democrats are acting as though their hands are tied because election-year politics have sparked mistrust of the governor's administration. The Senate addressed Martin’s delayed confirmation this week shortly after the IDOT audit was released. The report listed more than 20 problems with agency contracts, particularly hundreds of thousands of dollars in questionable spending on publicity for a Chicago expressway project. Before the Senate officially confirmed Martin for reappointment, Republicans questioned whether they could approve another cabinet member who will be involved in ongoing federal investigations of Blagojevich’s administration. Dillard flip-flopped within a few hours, voting to reaffirm Martin in committee and then joining the nay-sayers when the final vote came to the floor. Meanwhile, Martin had been called by the Senate Republicans to come to the Statehouse. He obliged and was questioned by the caucus and then by reporters. “I asked them to read the whole report," Martin said. "And we will be sitting before them in the Legislative Audit Commission. If you look at the findings, recommendations and the status - again reading the entire report -– you will see that IDOT has made some significant structural changes since the audit was done and completed, and we were doing it while the audit was ongoing." He said his meeting with Republicans did not predict the fate of the governor’s capital plan. The General Assembly’s schedule, on the other hand, might give more of a hint: The Senate canceled session Friday through Monday, returning Tuesday. The House will return Monday afternoon. It doesn’t look like the rank-and-file lawmakers are scrambling to agree on a capital budget, after all. Chicago Democrat Rep. Robert Molaro said he will come back to the Capitol on steroids next session, a playful way of saying he'll beef up his efforts to gather a few more votes for his narrowly defeated measure to give more money to the horse racing industry. His measure failed two times, both after lengthy debates. The first time, he would have had enough votes to pass the bill out of the House, but Republican Rep. Lee Daniels was not on the floor to push the "yes" button. Today, he fell two votes short. In defeat, Molaro said: “I feel like I'm Rick Monday or Bobby Murcer in the Cubs in the seventh. I get to the warning track, and I can't hit that homer. You've forced me to go on steroids. And next year, I will be back here with these bills, and it will be Molaro on steroids, so look out." The whole General Assembly is trying to move in fast forward so politicians can go home for the summer by April 7. Yet, their progress has been bogged down by disagreements on how to spend next year's budget. Numerous special interests are fighting for nonexistent extra money from the state. Molaro's controversial idea was to swipe 3 percent of riverboats' profits, which are already taxed 50 percent, to give horse tracks more money so they can boost dwindling attendance. A longtime Democrat leader of gaming issues, Rep. Lou Lang of Skokie, said he couldn't support the bill because it would take $50 million from riverboats to save a separate gaming sector. "It would be as if we taxed restaurants to help the plumbing industry. There is no reasonable public policy that says to us, 'Let's put a tax on one industry to help another stay alive.'" In light of the pending budget, Lang said he couldn't imagine going home to constituents and explaining “why we gave $50 million to racetracks instead of to schools, instead of to healthcare, instead of needy families, instead of housing, instead of a vast array of areas that need our help." Molaro said his "jobs bill" would have helped more than 30,000 families stay employed by Illinois' horse racing industry. Hi from the Illinois State Capitol. 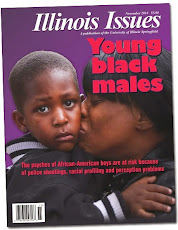 I'm Bethany Carson, Statehouse bureau chief for Illinois Issues magazine. I've got a front-row seat to the Illinois General Assembly and would like to share the more personal accounts of Statehouse activity through a regularly updated blog, a first for Illinois Issues. We are an independent magazine published by the Center for State Policy and Leadership at the University of Illinois at Springfield. Our mission is to help policymakers and citizens make informed, ethical decisions. We will use our blog as a way to offer up-to-date information and clear up misinformation, not add to the rumor mill. I welcome e-mails in response to our postings. Send them to capitolbureau@aol.com. We will not directly post readers' comments, but I may address them in a blog entry.